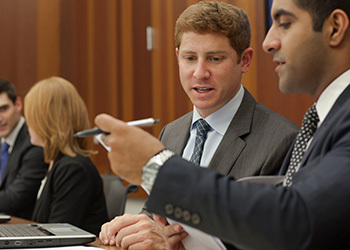 The Litigation and Alternative Dispute Resolution (LADR) curriculum is designed to provide a comprehensive and balanced professional education that adequately prepares students to practice law, with a focus on litigation and alternative methods of resolving conflict. The innovative curriculum stresses the connection between legal doctrine, skills and values, and the art of lawyering. It aims to produce reflective practitioners who incorporate high standards of competence, ethics and social responsibility. Day and evening students may apply to the program in the spring of their first year at IIT Chicago-Kent. To earn the LADR certificate, students must complete 21 credit hours of approved course work, which includes five required lawyering process courses, one required doctrinal course, plus one elective doctrinal course. The LADR student memo contains detailed information about the program requirements and curriculum. We are now accepting applications for the LADR certificate program. The due date is March 24 at 12:00 p.m.
As required of all J.D. students, those enrolled in the LADR Program must also complete course work in basic civil procedure and legal research and writing (Legal Writing 1, 2 and 3, plus a seminar). Other course work falls under the category of theoretical and ethical foundations of law (professional responsibility and ethical dimensions of skills training). Elective courses allow students to go into greater depth in areas of special interest. Learn about careers in litigation and alternative dispute resolution and how Chicago-Kent can help you gain the knowledge and skills you need for success.